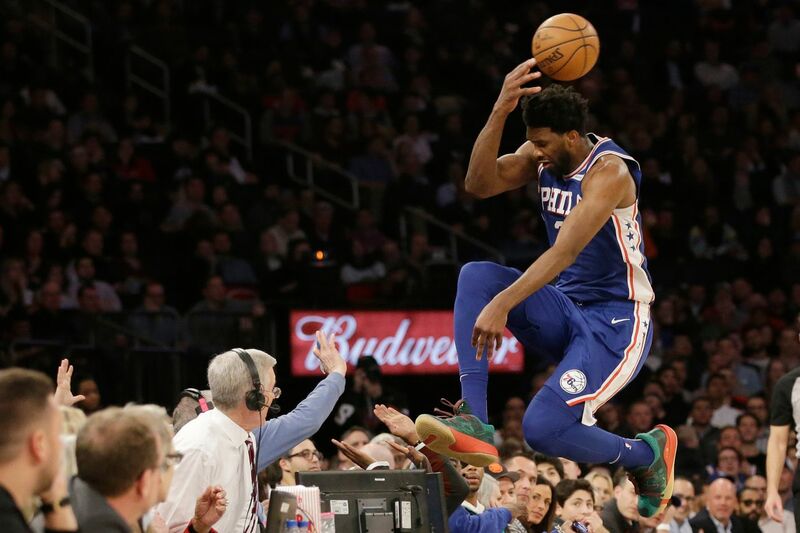 76ers star Joel Embiid leaps into the stands while chasing a loose ball during the second half of the team's 126-111 victory over the Knicks. NEW YORK — Madison Square Garden was quiet for most of Wednesday night, and understandably so. The Knicks had lost their previous 17 games, and there wasn’t much to suggest that they would avert an 18th consecutive loss, to the 76ers. Sure, in the first half, Kevin Knox had cut through the lane and hammered down a violent dunk over Ben Simmons, but that flash of noise had faded by the final three minutes of the third quarter, as the Sixers built and retained a double-digit lead. Then, with little more than two minutes remaining in the quarter, with the Sixers ahead by 15 points, JJ Redick threw a pass to Joel Embiid that zipped through Embiid’s hands. The ball bounced toward the sideline and the scorer’s table. Embiid took four steps as he chased the ball, planted his left foot, and flipped the ball over his head with his right hand as he launched himself into the crowd, over actress Regina King. He landed on Dave Fried, the longtime statistician for Mike Breen, the Knicks’ play-by-play voice on the MSG Network, and Fried seemed to disappear, as if he were a soda can that Embiid had crushed into a little silver disk. Embiid, fortunately for him and the Sixers, did not. He clambered out of the stack of bodies, made sure that Fried and King had survived, and returned to the game — without a limp, but with what seemed the faintest of smiles of his face. No one would dispute that Embiid regards himself as something of a showman, that he has an impish streak — on social media, while answering questions during a media scrum, even during a game — that creates the impression that he courts attention for attention’s sake. But those childish word choices were minor infractions, especially when compared to the consequences that could have resulted from a flying leap, into a treacherous area, that he never needed to take. There was nothing for Embiid or anyone else to guess about. This was not a Game 6 against the Celtics or Raptors. This was not a sequence of lasting significance for the Sixers. This was Embiid jumping into the stands in the last game before the All-Star break, with the Sixers up 15 against a team that had lost 17 in a row. These were circumstances that demanded a player, particularly a superstar of Embiid’s importance and intelligence, exhibit a sense of and appreciation for situational basketball, an ability to take the measure of a moment and act or react accordingly. The Sixers depend too much on Embiid, and he has too long and diverse an injury history, for him to be taking such chances, and even his head coach, as he watched all 7 feet and 250 pounds of Embiid sail through the air and crumple to the floor, couldn’t deny the terror that crossed his mind. Joel Embiid didn’t avoid it. He embraced it, and he succeeded in waking up, for a while, an uninterested crowd inside The World’s Most Famous Half-Empty Arena. Yet for all the plaudits he might get for playing into the image that Philadelphia sports fans prize most — the pro athlete who’ll do anything at any time to win — the most substantial praise he received was not for his journey into those courtside seats but for his disposition once he arrived. He and the Sixers were just damn lucky he could.